*Gasp! * So why is it copyrighted for 2003? Because that’s when the series started. My first website started in 2003…….Actually 1992 but’s let’s not go back THAT far…You don’t want to see that one. Now that’s a sad name, but it’s all I could think of…..(shrugs) I think those were my really bad ametuar years, but you gotta start somewhere right? This was a little more advanced, with a total of 4 frames at one time and also this is where I got up to Episode 15……Of course around then I realized…..No one knew it existed. 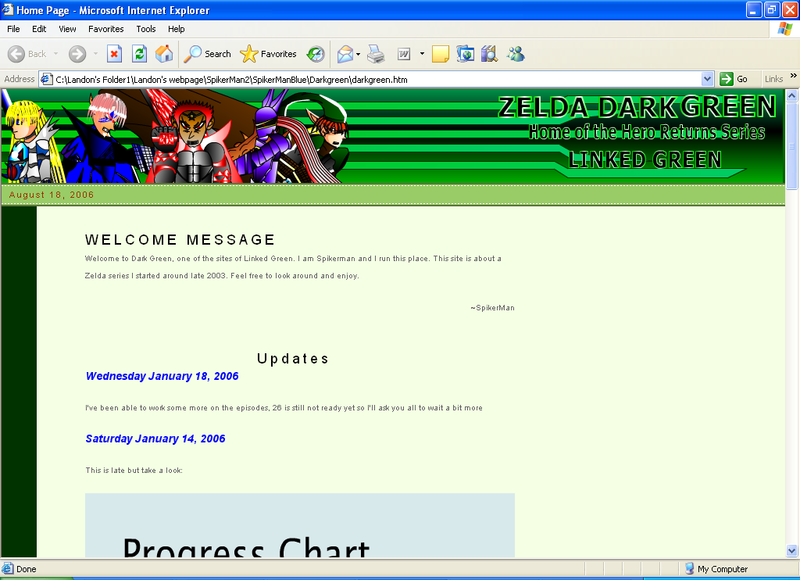 At the time SpikerMan Blue was a mix of my SpikerMan and Zelda content…Which wasn’t bad……Just really confusing, but most Zelda webmasters would only affilate to me if it were just Zelda……So…….. 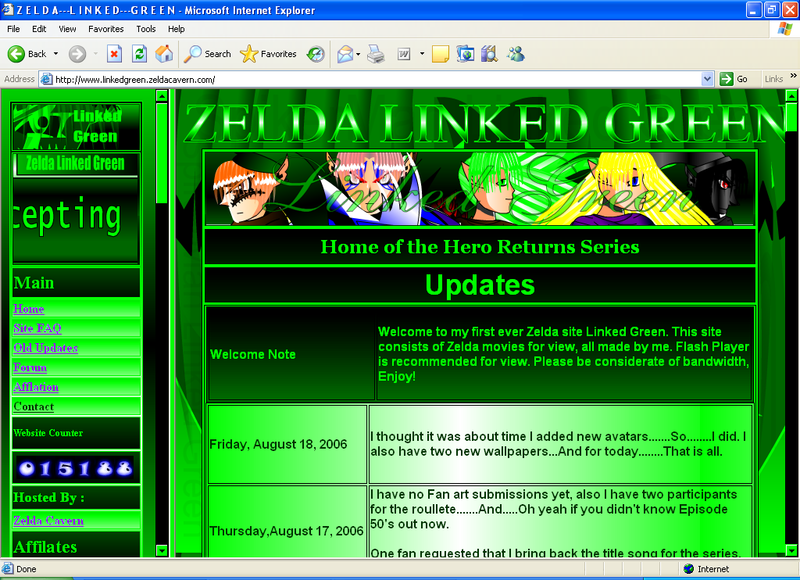 Linked Green 1 is the site you see right now, this is my favorite of all because it’s bright and very pleasing to the eyes. I’m sure any or all fans would agree that the color is what gets your attention. It’s a very simple layout, everything you need is on the left frame. 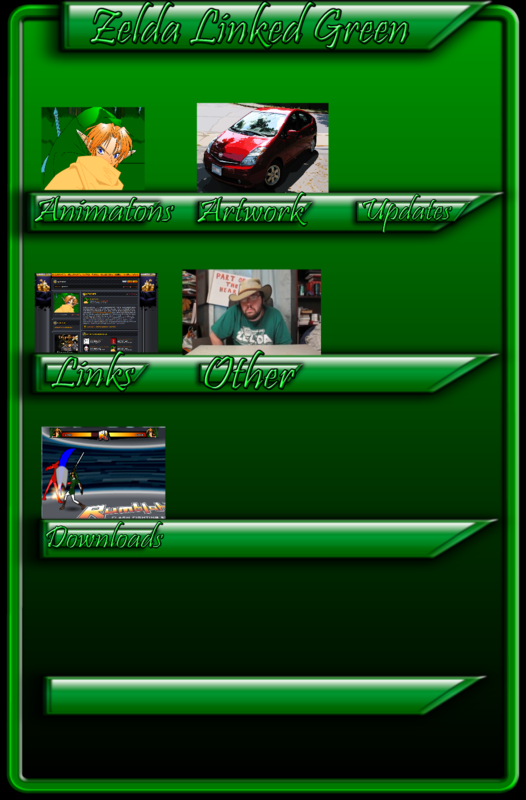 Some of you saw this one for a little while, it was before I had problems last year with my server, it was organized a bit more but it just felt……lame….So I brought back the first Linked Green. 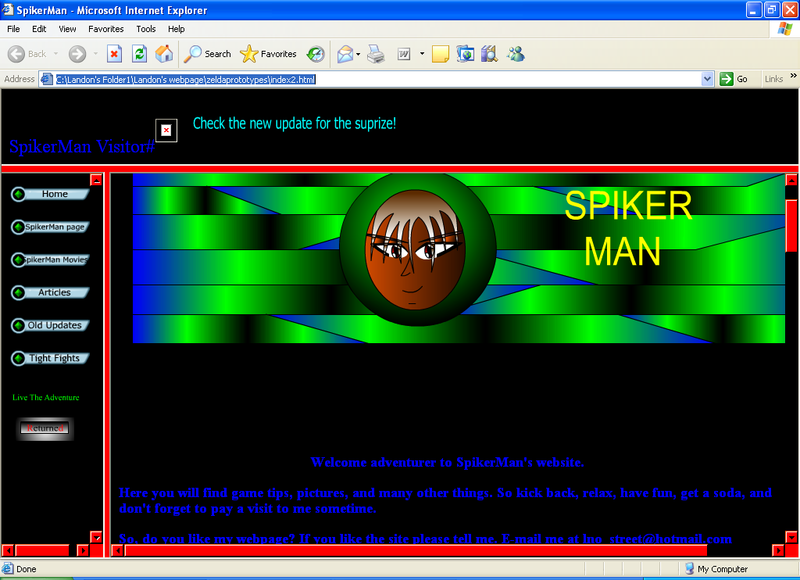 I would say that the SpikerMan site is not that popular because it’s a new thing and I do not have much information on it, but it’s still a fun project for me to do. 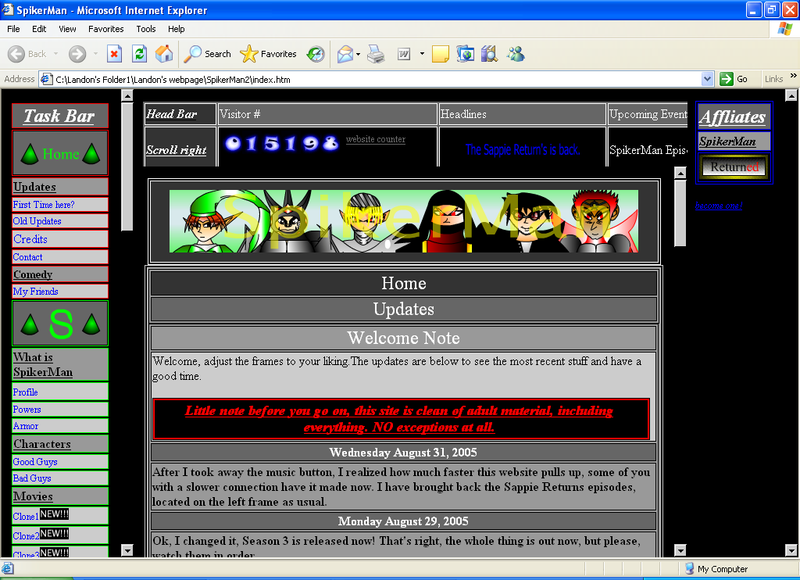 In the later 2000’s the site was expanding and evolving into different styles. A lot of the front pages were Flash Menus and eventually Photoshop images. 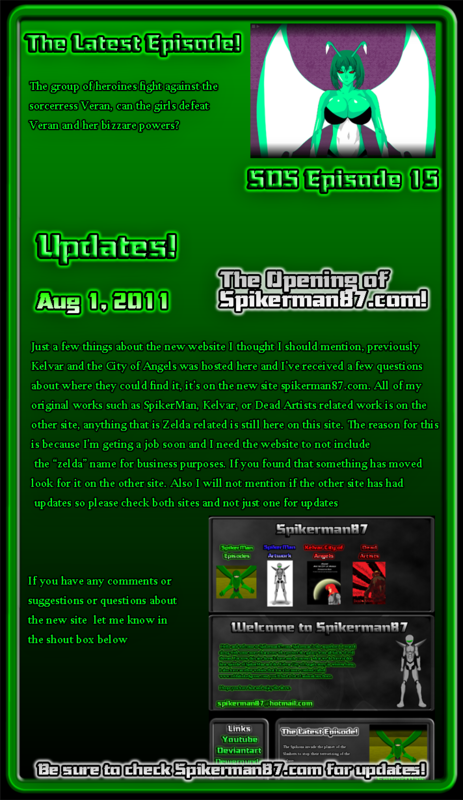 August 11, 2011 I was able to set up a new website called www.spikerman87.com This was mostly for business purposes and it allowed me to post my own personal content. Spikerman87.com has had 3 different versions since it’s release. The current one in 2012 being in Word Press format. The series started in 2003, I started to work on Episode 1 around October that year and continued to work, but then I wasn’t as good and I didn’t have much inspiration because I knew it really wasn’t good. On 4 Wayed Grey I released Episode 10 on June 16th of 2005. As the series moved on it pretty muched evolved, This showed how I got into gear because from June 16th to August 29th I had the next season(3) already out, even after that I got Season 4 out before 2005 was over. So on June 16th I was on Episode 10, by December I got to Episode 25. I had a lot of server problems around that time so things got more difficult for me but I some how pulled it off to squeeze Episode 25 to the internet before the year was over. At the start of this year the Episodes were getting harder to make, I couldn’t be as sloppy as I was last year and the year before, the Episodes were changing in more ways anyone could imagine. Late February is when I was able to find a new server so I could at least get the website back in the swing of things. It wasn’t until March 7th that I could release a new episode and continue the 5 Episode format. On April 6th I was finally able to complete Season 6 with Episode 30. I started Season 7 on May 6th and due to me moving into a new house I could not release another episode until May 21st, soon after I completed Season 7 on June 6th. For the next two seasons I decided to skip 10 Episodes and move on to the ending of the series with Season 10 which aired on July 6th and ended with Episode 50 on August 14th. The newest Season-season 11 started on September 8th and since it’s the last season for the year I decided to extend the release dates to 1 or 2 a month. The Hero Returns Series will end with Episode 57 in December of 2006 and the last two seasons will be released in early 2007, then the series will be completed. I’ve run this series for 3 years, and it will be almost 5 years when it’s completed. After this series I had in mind a new idea to bring one of Coolo’s enemies: Eclipso and run a much shorter series (15 episodes at least) And after that we’ll see. In 2007 this will be a Animated Zelda fanfiction epic. I started the Eclipso series on May 24, 2007 the first few seasons ran from May to December, I had planned Eclipso to be a short series, but I miscalculated and now ran it to be 31 episodes. 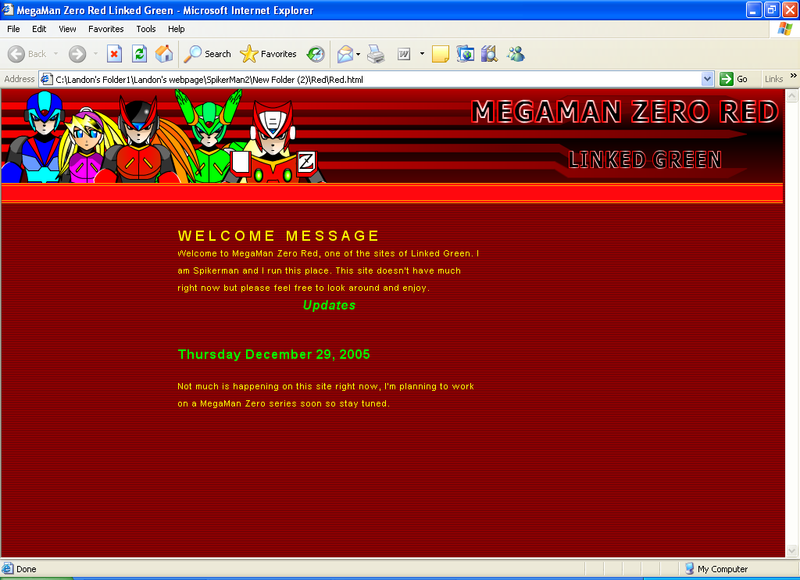 Episode 30 was released May 29, 2008, Eclipso took a year and five days to make. In the last half of 2008, I made three remake episodes of Hero Returns: Episode 1, 30, and 42 because I thought they were the best of the series respectively. 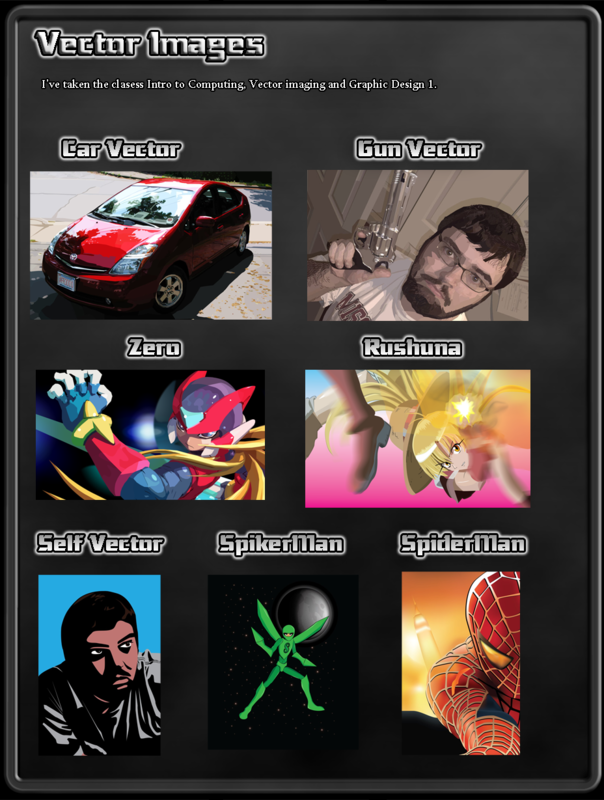 Seven Dark Sorcerers was started in mid 2009, and expanded on many features including the artwork and voice actors. currently airing. 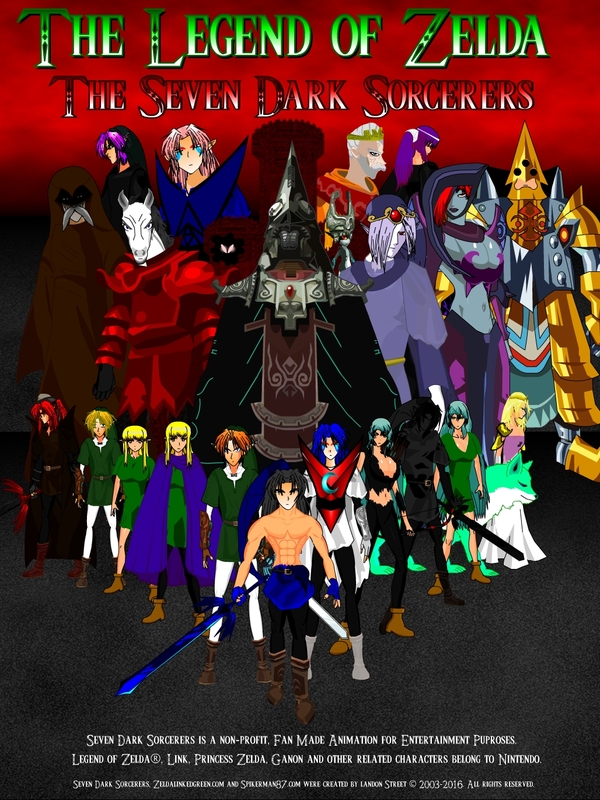 Seven Dark Sorcerers has been airing since 2009, through out the years the creator SpikerMan had some things to go through with college so the episodes came out less and less each year.